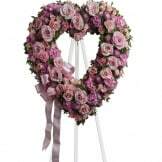 A breathtaking expression of love and devotion, this wreath delivers a message that is both subtle and strong. 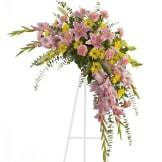 Its soft pastel blossoms will soothe, while its extraordinary beauty will express the depth of your emotions. 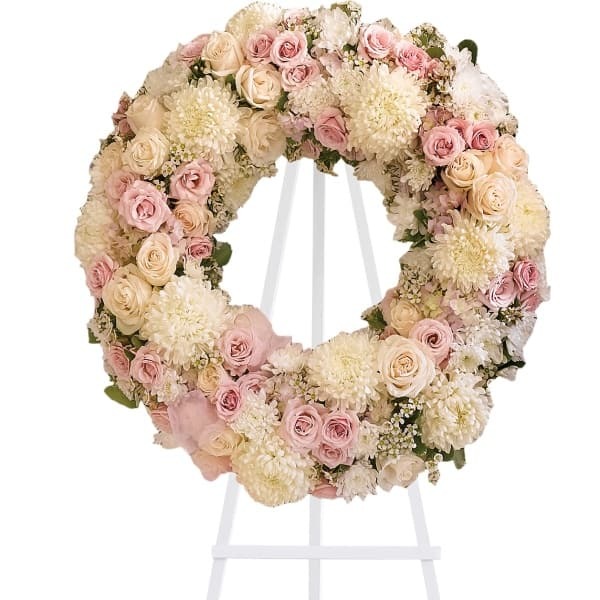 • Gorgeous pink hydrangea, crème roses, light pink spray roses, white chrysanthemums, waxflower and more are adorned by pink organza ribbon in this eternal circle of peace. • An appropriate gift sent from a family member. 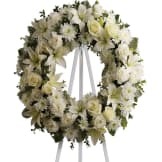 • This wreath measures approximately 24 1/2" in diameter. 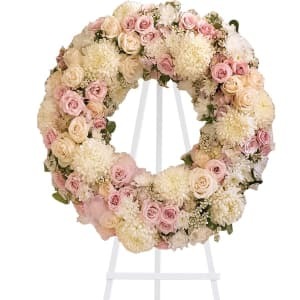 Flowers will be received by a Hartzler Funeral Services' staff. The wreath was delivered on the morning of the service as requested and was stunning. The flowers were so fresh and the soft colors were exactly right. It was the perfect choice to honor my sister. All of our flowers are designed and delivered by hand from a local florist in in Akron.